I got an email with a photo from Elf at Redfish. They are in Texas for Stitches. Here is a picture of their booth. If you are in Texas and plan to go, stop by and say hi from me! I wish I could have gone. They were at our conference in San Diego and I bought yarn for my latest project (more about that later) and I left my season sweaters with them to take to the show. I was out of town last week and I was surprised that more lessons had not arrived. Generally the fall is quite busy. I did get several requests from students who had signed up over a year ago wanting to know if they could continue. Again, I do not enforce any time limits. Just send me an email to see if the materials have changed. I am back to topics on how to fix mistakes. There are two "lace" swatches in my Basics class. Frequently students have difficulty with these swatches and the problem is always due to the yarnovers. If you miss a yarnover anywhere in the swatch, it will not turn out correctly. I've noticed a couple of types of mistakes over the years. 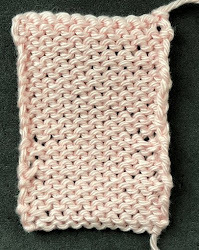 One student contacted me to let me know that there was a problem with the swatch instructions, that there was not enough stitches. It took me a while to figure out what she was doing. She was interpreting the abbreviation of YO to mean "bring the yarn forward and then knit the stitch." Of course she was running out of stitches. (For the purposes of this discussion, I am making the assumption that all of the stitches on the RS are knit stitches.) A yarnover means just that, bring the yarn forward and over the needle. This places a strand of yarn between the stitches. You then go to the next instruction. What happens if you don't catch it soon? Well, you can fix it but keep in mind it might not look great since you are creating stitches out of nothing. This photo shows three locations where yarnovers are missing. The one on the top row is the easiest to fix. You just pull up the horizontal strand between two stitches on the WS row. This photo shows a close up of one of the missing yarnovers. To fix it, you have to create stitches out of the horizontal strands indicated by the arrows. The problem is that they are hard to see. In this photograph, I have pulled the stitches apart to show the horizontal bands more clearly. Now you can fix this mistake the same way you would fix any dropped stitch. Here is the fixed yarnover. Notice that the yarnover at the top is now very small. That is what happens when you stretch the fabric to accommodate the new stitches. Salon will be on Sunday, September 20th. We had the selection meeting for the Spring issue on September 10th. As usual, I am doing more than I planned. The yarn for one project has already arrived. I've made the gauge swatch and blocked it so I should be ready to go later today. I finished the cat scarf and sent it off to Martha who commented that it will be very warm...no kidding! She lives in Utah so I am not worried. Next up on the birthday front was Cara. I used Lorna's Lace Pearl which is 51% Silk and 49% Bamboo. I made a cowl for her. The photos don't show how shiny and gold this fiber is. This is wrapped around twice. You could even wrap it three times. I've started on my dress using the RedFish 3-ply. It uses a raglan construction. The bodice and the top portion of the sleeves are black but I am going to use gray gradients as the dress gets longer. It will be natural at the hem. Obviously I have a long way to go!